I really do like this retro camera from Fujifilm – The Fujifilm X10 is a 12-megapixel compact with manual controls, a larger-than-average, 2/3” type EXR CMOS sensor, a 28-112mm (eq.) f/2.0-2.8 lens and a newly developed Optical Image Stabilisation mechanism. Resurrecting the 2/3” sensor size that was commonly found in bridge cameras until the middle of the past decade, the Fujfilm X10 features a sensitivity range of ISO 100 to ISO 5000, expandable to ISO 12800 at reduced resolution. The new sensor also offers all the usual EXR shooting modes that allow the user to give priority to signal-to-noise ratio, dynamic range or resolution depending on the individual requirements of each shot. The newly developed 4x manual zoom lens comprises 11 elements (including 3 aspherical and 2 extra-low-dispersion elements) in 9 groups and benefits from a Super Electron Beam Coating that is claimed to reduce flare and ghosts. The maximum aperture is f/2 at the wide end of the zoom range and f/2.8 at full telephoto, while the available minimum aperture is f11 throughout. Raw image capture, a full range of manual controls, 4 different auto bracketing functions, 8 film simulation modes, a 360° Motion Panorama mode, electronic level gauge and 1080p Full HD video recording round off the features list. 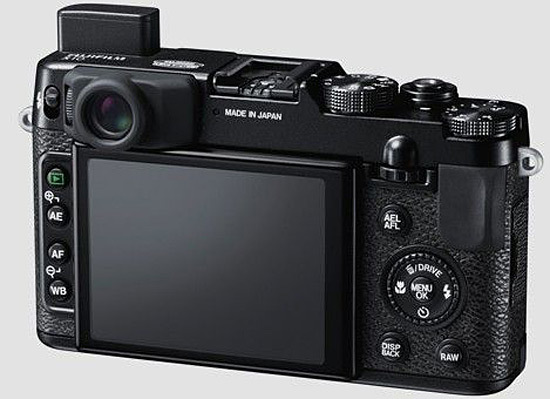 The Fuji X10 also boasts a hot-shoe, an integrated manual pop-up flash, an optical viewfinder and a 2.8” rear monitor with a resolution of 460,000 dots. 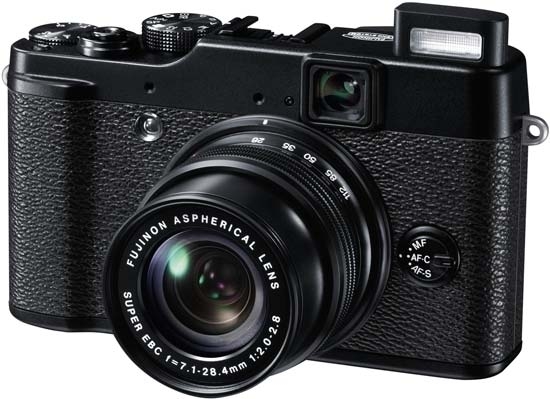 The Fujifilm X10 will be available in early November 2011, with pricing to be confirmed. Valhalla, N.Y., September 1, 2011 – FUJIFILM North America Corporation today announced the all new premium compact FUJIFILM X10 digital camera, featuring a new larger 2/3” 12 megapixel EXR CMOS sensor and a bright, high-definition FUJINON1 F2.0 wide-angle to F2.8 telephoto, 4x manual zoom lens (28-112mm)2 with a proprietary Super EBC (Electron Beam Coating) that produces superb image quality from edge to edge. The sleek X10 is a sophisticated compact digital camera that follows in the footsteps of the multi-award winning FUJIFILM X100, and it now combines a trim and refined blackout design, an easy-to-use manual barrel zoom lens and a traditional optical viewfinder with a wide 20° field of view for exceptional image composition. The X10’s stunning body is built from lightweight, yet ultra strong, die-cast magnesium alloy and has an upper control deck with mode dials and an aluminum milled, textured finish lens ring. The 4x manual zoom lens ring doubles as an on/off power switch, ensuring fast start times to capture even the most fleeting shooting scenario. “Fujifilm is dedicated to elevating the art of digital photography, and the X10 premium compact underscores that commitment by offering first-class image quality, beautiful styling and the innovative technology that exceeds consumers’ expectations,” said Go Miyazaki, division president, Imaging and Electronic Imaging Divisions, FUJIFILM North America Corporation. The X10 features a newly-developed, larger 2/3” 12 megapixel EXR CMOS sensor that combines Fujifilm’s proprietary EXR technology with CMOS technology to provide bright, sharp images in all shooting conditions. The intelligent EXR CMOS sensor automatically selects the optimum shooting mode from a total of 99 different variations to capture every type of scene perfectly, even in the most difficult photography situations. SN (Signal to Noise) High Sensitivity and Low Noise – produces clear and sharp high-sensitivity images while keeping noise levels low, which is ideal for capturing night scenes or indoor situations with poor lighting. DR (Dynamic Range) Wide Dynamic Range – delivers an increased dynamic range (up to 1600%) to deliver rich gradations and detail in both shadows and highlights. HR (High Resolution) – takes full advantage of the 12 megapixel resolution to reproduce the finest details in landscape and portrait scenes, perfect for use on bright clear days. The X10’s fast EXR processor also delivers high-speed continuous shooting – up to 7 frames per second – at the full 12 megapixel resolution (L size), and 10 frames per second at the reduced resolution M size. The X10 features a newly-developed high-definition FUJINON 4x manual zoom lens (28-112mm) with a Super EBC (Electron Beam Coating) that achieves superb image clarity from edge to edge. By treating all of the lens elements with the multilayer Super EBC, the X10 expertly reduces ghosting and lens flare and delivers an impeccably sharp image. The lens consists of 11 glass lens elements in 9 groups, including 3 aspherical glass lens elements (6 sides) and 2 extra-low dispersion lens elements. Together with its wide-angle maximum aperture of F2.0 to a maximum telephoto aperture of F2.8, the X10 delivers beautiful, bright images with outstanding clarity. In its spacious glass optical viewfinder, the X10 uses an arrangement of 3 aspherical lenses plus a special 2 glass prism configuration to give the photographer a composition experience that is marked by superior brightness and superb field of view with its extra wide 20° viewing angle. In less than one second, photographers can be ready to shoot in almost any situation thanks to the X10’s power switch that has been aptly integrated into the manual zoom barrel. This smart and simple design feature allows faster photography response times and helps to avoid missed photo opportunities. Once ready to shoot, the X10’s all-metal lens barrel and smooth zoom rotation helps you compose photos quickly and easily, and its remarkably quick shutter-release lag time of approximately 0.01 seconds lets you capture even the most momentary of photography scenarios. The X10 also features a newly developed Optical Image Stabilization mechanism that all but eliminates motion blur by maximizing sensor performance, and its 49-point matrix contrast auto focus provides high-speed and high-precision focusing thanks to the fast CMOS capabilities and the advanced EXR Processor system. The X10’s lens is capable of taking super-macro shots as close up as 1cm, and combined with its 7-blade aperture, the X10 generates a stunning soft-focus “bokeh” effect that makes it the ideal choice for shooting perfect portraits. The X10 is proudly manufactured in Japan, and as a mark of true quality, it prominently features the words “made in Japan” along the rear of the chassis near the viewfinder.